After a great Halloween sale! We are at it again for this weeks Devblog! Come see what the team is working on. 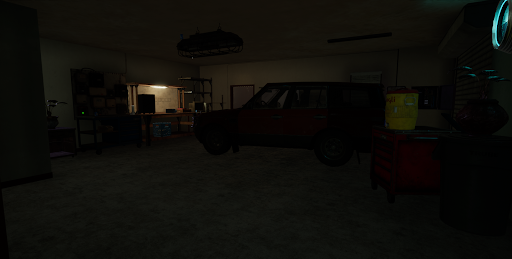 More ongoing work on Vacancy mission, this time with an emphasis on the interior gameplay segment for the gas station. I don’t want to really talk about anything specific (because spoilers are bad mkay?) so instead, here’s an updated screenshot. This week was all about getting Update 4 released. So other than bug fixes, I finished up implementing the Recipe System UI, implemented a few user experience things that either I have caught or the community has. Also cleaned up navmods around cars, optimizing how we detect Navmesh Mod collision by using a Box collision inside all cars instead of using their meshes as the mod for nav mesh. It’s much cheaper with 4 point than whatever random points cars had. After all that, I worked on adding Advanced Graphics settings in the menu. I've been tying together the art, scripting, and gameplay for the new mission, Vacancy. Nothing super glamorous yet, just giving a second pass to the groundwork laid down by Lawrence and Paul. There should be some cool stuff to show on that front soon though. Other than that, I've been helping Brian here and there with some minor audio related blueprint work problems. This blog is going to be kind of short cause there just isn't too much to talk about (or even screenshots to take!). Hopefully next week should bring some better goodies to the table. This week I have focused on dialling down and fixing the issues reported with sound in multiplayer sessions, as well as optimising and polishing the audio within the current and future missions, tuning the volumes and attenuation and spatialization for optimum performance and quality. This work has been time consuming, but is vital for the AAA VR feel we are striving for. As well as bug fixing and polishing previous work, we have spent much of this week collaborating on by far the most ambitious zombie archetype in the game so far. As well as being able to swipe, lunge and dive at players; now the runners have an advanced AI climbing and parkour system that allows them to not only run faster than a player, but also to be able to vault over fences, dive over large obstacles, wall run/climb up to high places and dive off buildings in order to get their prey (you).